As we near the midpoint of 2017, let’s take a step back and look at some workday habits that can help you stay productive and effective throughout the rest of this year and into the years to come. This is a bit of a follow up to a video that I made earlier in the year in which I outlined the daily routine that will help me achieve the goals that I have set for myself. Having established the overall flow to my entire day at the beginning on the year (and still enjoying that flow) what I’m choosing to focus on during this mid-year check-in are the habits that I have in place during my dedicated work hours, the time that I spend within the office space that I rent from Wayfinding Academy. So whether you are self-employed like me or you work in a more collaborative setting, my hope is that you find it useful to take step back and look at your workday habits. 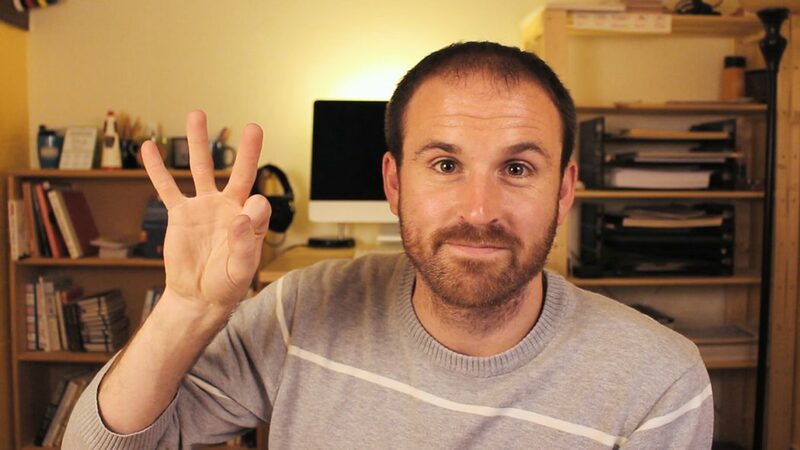 You might even want to steal one or all three of the specific habits that I’ve found to be most useful, so let’s get into those. The first two habits are the first two things that I do when I walk into my office. I begin by creating a task list for that day. These are the things that I’m choosing to prioritize, the things that will move my various projects forward in a meaningful way. I have a dedicated space within this office where that task list lives. It’s on my door, actually, a door that I have coated with chalkboard paint so that I can write and erase to my heart’s content. There are two things that I like about writing that task list on my door. The first is the limited amount of space that it provides. 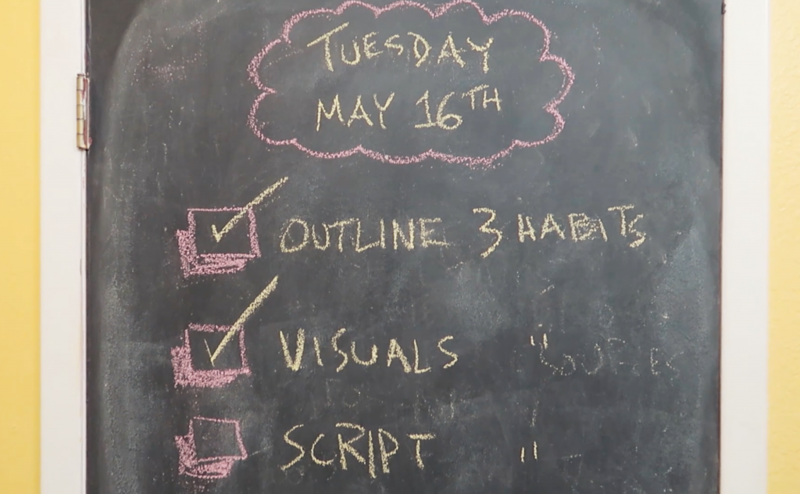 Based on the door size and the large sidewalk chalk that I use, I can only fit so many tasks there, which is a good thing – it ensures that I don’t try to cram too many things into a single day. The second thing that I like about that task list is how visible it is. It’s always in the background, reminding me of what I have established as the most important things to work on. I know that some people like to create a list like this at the end of the previous work day. I can see why that’s useful, but for me I love being able to check the last item off of that list, and then walk out the door, leaving that day’s work behind me. That helps me create a bit of separation from my work during the evening than if I had already created tomorrow’s list and was starting to worry about it. I also find that my morning routine of reading and stream-of-consciousness journaling often impacts what I choose to work on that day, so for me there’s something fresh and cleansing about walking into this office in the morning, erasing yesterday, and starting today. Immediately following the writing of that task list, I review my personalized code of ethics, which I encourage you to establish as well. This is a habit that I picked up from Todd Henry’s book Die Empty, and it’s one piece of a larger morning check-in process that I’ve found to be very useful. The idea is that establishing and reviewing a code of ethics will set the tone for how you’ll engage with the tasks of that day. They’ll help you to show up and to act in ways that are aligned with the person you want to be. The format that I’ve used with mine is a two-word title, a simple but active visual, and a written description that speaks to me. One by one, I cycle through my code of ethics while reviewing my tasks for that day as I consider how I will bring those ethics into the work of completing those tasks. Since establishing these ethics earlier this year, I’ve made some small adjustments to the descriptions and titles, adding some nuance or a new angle that I’ve found to be important. 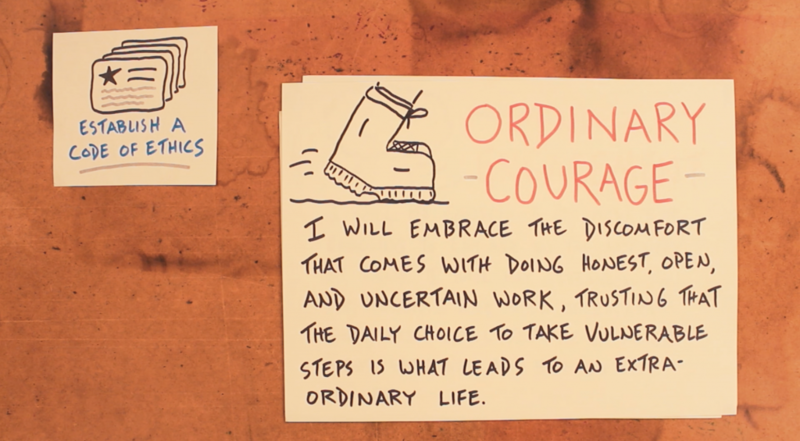 I also recently added a fifth ethic to the original four: ordinary courage, a term that I came across in the work of Brené Brown, and an idea which represents an important piece that was previously missing. So know that your code of ethics can evolve with you as you learn more about yourself and your work, but first you’ve got to establish what you’ll start with, and you’ve got to commit to reviewing them each day. The third habit comes in after you’ve been plugging away at those tasks for a while, when you might need to clear your head with a mid-day meditation. I don’t about you, but for me the biggest slump in my day, the one that’s most difficult to overcome, happens right after lunch. Your belly is full, and hopefully you got to step away from your work, maybe to go each lunch with some friends or catch up on YouTube (which is my lunchtime entertainment), but now it’s time to get back into work mode. I’ve found that a guided meditation is a great way to ease that transition, to help you reset and reboot so that you’re able to take on the second half of your work day from a clearer headspace and with a bit more energy. I’m currently using an app called Insight Timer, which has many guided meditations to choose from. I’ve been listening to Tara Brach, who was recommended by Maria Popova and Tim Ferriss. I’m enjoying the guided meditations rather than unguided specifically because of the mid-day lull, and how helpful it can be to have someone else’s voice guiding you rather than putting in the mental energy that it takes to guide yourself if you do it solo. I also think that the guided meditations are great if you’re totally new to meditation in general – you just hit play, sit back, and follow directions. This mid-day meditation habit is the newest of the three that I’ve mentioned, and I’m excited to keep experimenting with it throughout the rest of this year, trying different guided meditations when I get bored with the current one, and maybe trying some unguided meditation as well. 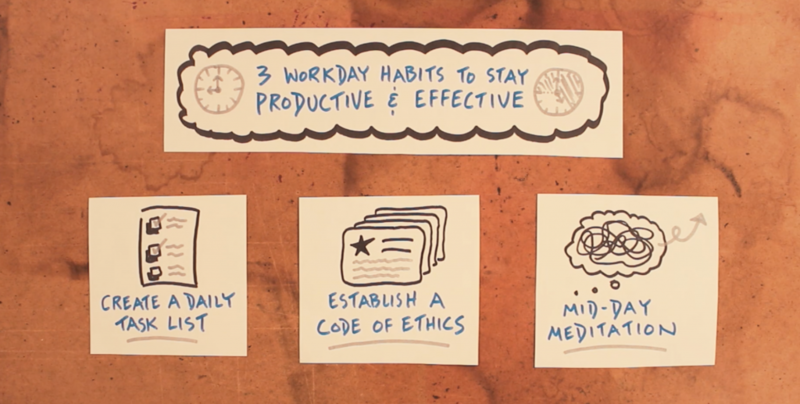 The three habits that I’ve just described are the anchors to my work hours, and if any of them intrigue you, then please do try them out for yourself. But also stay open to other habits that you can build into your day to help you plug away at the work that is most important to you. And if you’d like to develop visual note-taking as a tool to help you do better work and share that work in an engaging way, then check out our courses. If you’re an educator interested in bringing visual note-taking into your classroom, check out Sketchnoting In The Classroom. And if you want to create new personal and professional opportunities by sharing the authentic journey of your skill development online, check out Learn In Public.